Input text: It is morning. The sky is 1st fire texture. The 1st fire texture is 1000 feet wide. The ground is hell texture. The hell texture is 100 feet wide. There is a 10 feet tall skeleton on the ground. There is a 7 feet wide 2nd fire texture tornado -6.5 feet under the skeleton. There is a flat 15 feet wide shiny silver sphere on the ground under the skeleton. The sphere is facing up. There is a 20 feet wide shiny orange north star behind the skeleton. The north star is 6 feet inside the ground. There is a 7 feet long white lightning to the right of the skeleton. The lightning is -10 feet below the skeleton. The lightning is leaning 60 degrees to the right. There is a 7 feet long white lightning to the left of the skeleton. The lightning is -9.5 feet below the skeleton. The lightning is leaning 60 degrees to the left. There is a shiny red copper 5 feet tall 1st cannon .5 feet to the right of the skeleton. The 1st cannon faces the skeleton. There is a shiny red copper 5 feet tall 2nd cannon .5 feet to the left of the skeleton. The 2nd cannon faces the skeleton. There is a 4 feet tall copper 1st ak 47 above the 1st cannon. The 1st ak 47 faces the skeleton. There is a 4 feet tall copper 2nd ak 47 above the 2nd cannon. The 2nd ak 47 faces the skeleton. There is a 3 feet tall 1st bomb .5 feet to the right of the skeleton. There is a 3 feet tall 2nd bomb .5 feet to the left of the skeleton. 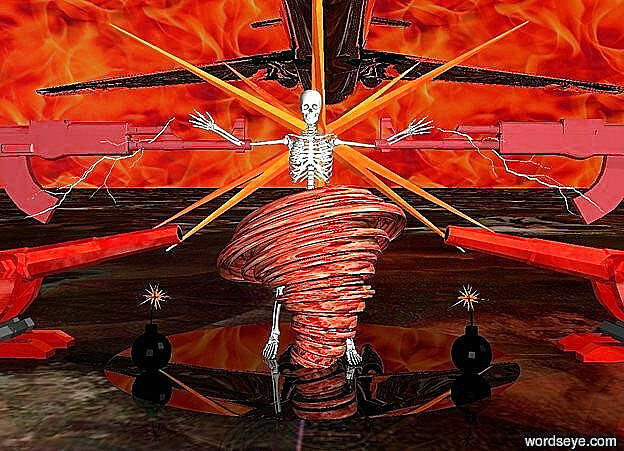 There is a 100 feet wide silver airplane 10 feet behind the skeleton. The airplane is 20 feet above the ground.